The Douglas A-26 Invader (designated B-26 between 1948 and 1965) is a twin-engined light bomber and ground attack aircraft that was built by Douglas Aircraft Company during World War II which also saw service during several major Cold War conflicts. A limited number of highly modified United States Air Force aircraft served in Southeast Asia until 1969. It was a fast aircraft capable of carrying twice its specified bomb load. A range of guns could be fitted to produce a formidable ground-attack aircraft. 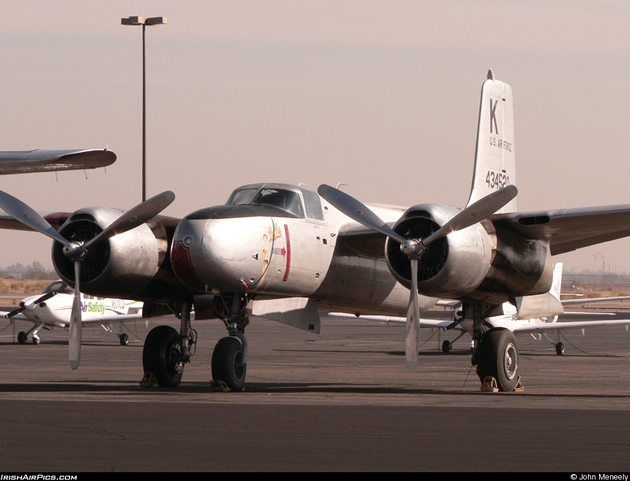 A re-designation of the type from A-26 to B-26 led to confusion with the Martin B-26 Marauder, which first flew in November 1940, about 16 months before the Douglas design’s maiden flight. Although both types were powered by the widely used Pratt & Whitney R-2800 Double Wasp eighteen-cylinder, double-row radial engine, they were completely different and separate designs — the Martin bomber originated in 1939, with roughly twice as many Marauders (nearly 5,300) produced in comparison to the Douglas design.